Are your evenings feeling a little too chilly this winter? Guanajuato Contemporary Mexican and Tequila Bar (73 Green Bay Rd., Glencoe, IL 60022; 847-242-0501) has the perfect solution to warm you up on Saturday nights. 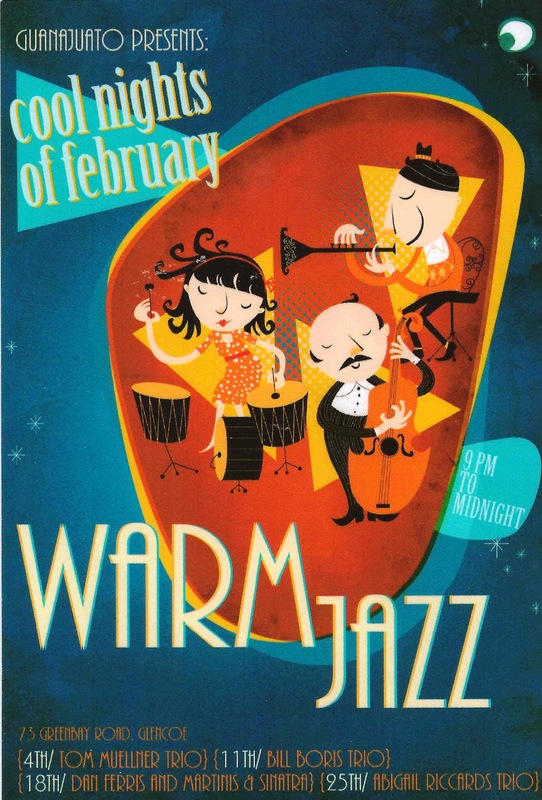 This February, they are not only the place to go for delicious Mexican food on the North Shore, but they are also presenting a Cool Nights, Warm Jazz series on Saturday nights in February to keep away the chill. February 18, Dan Ferris and Martinis & Sinatras will perform from 8 to 11 p.m. The jazz quartet expertly performs the jazz standards of the “Sinatra era,” including standards from the American Songbook. Let them transport you back in time as you enjoy their music. February 25, the Abigail Riccards Trio will perform from 8 to 11 p.m. Abigail Riccards is a celebrated jazz vocalist who regularly performs in jazz venues in New York and Chicago. Her three albums have garnered a lot of praise, and she teaches regularly throughout the country. For more information on Abigail Riccards, visit www.abigailriccards.com. Winter doesn’t have to give you the blues. With their delicious food and hot jazz, Guanajuato will give you the warm jolt you need to get through until spring.